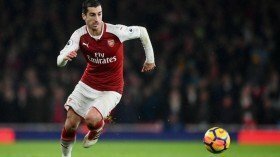 Arsenal have suffered yet another injury blow with Henrikh Mkhitaryan sidelined from first-team duty for around two months with a fractured metatarsal. The Armenia international was subbed off during the half-time break of the League Cup quarter-final defeat to Tottenham Hotspur last week and Unai Emery had thereafter suggested that the attacker had sustained a minor injury. However, ahead of the Gunners' league game against Brighton & Hove Albion, it has been confirmed that he has suffered a fracture in his right foot which should keep him out of action for the next six weeks at the least. Arsenal are already without Danny Welbeck for the rest of the season after his ankle surgery and Mkhitaryan's absence for the short-term could tempt the club enter the transfer market at the turn of the year. Lille's Nicolas Pepe has recently been highlighted as an option to solve the club's injury crisis upfront but his staggering £72m asking price remains a stumbling block for the winter period.